– 35 euro for people who come from abroad!!! I am interested in researching the dance in which theater, the game, frankness in emotions are encountered, a dance that will draw the attention of a random spectator and will be interesting not for the dance himself. This is the type of dance that combines seriousness and humor, paradox and reality. I have studied to be a choreographer, I´ve been taught various skills of training and means of teaching the body of another person. In my “archive” there are many stage pieces from folk dance to ballet miniatures. My work in the Theatre has been the tastiest. The actors, direction and dramaturgy broadened my mind and my image of the dance art form. I began to see how the art of charming the audience is created. 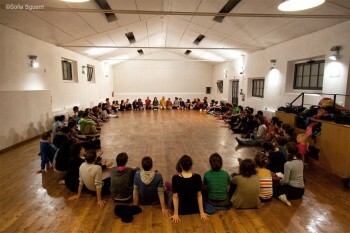 Since I´ve met contact improvisation and the first CI teachers, I practice the art of de-educating the body of another person and disentangling the illusions about movement and dance. I think that the human being is already perfect the way it is created, and I believe in nature and it´s laws. I´m prompted in life by the ability to fall in love unconditionally and undoubtedly with people, movement, mountains, journey, ideas. This ability has helped me to learn everything that forms me right now. This is what teaches the others. CI is the only dance that helps me leave the limits of personality and transform my consciousness. In this sense I´m the student, not the teacher. The better I learn, the more chances have the others to learn something from me. My special interest in contact improvisation is clarity. Clarity towards the practice. Honesty towards how do I move my weight in the space of Gravity. Attention towards clearing the dance from the personal. Letting things happen as they do. I´m grateful for meeting such teachers as Steve Paxton, Nancy Stark Smith, Danny Lepkoff, Benno Voorham, Lisa Nelson, Esther Gal, Alexandr Girshon, Yaniv Mintzer, Yorg Hassman, Martin Keo and many others. Topic of the class will be about the “intuition” in improvisation. Through a clear understanding of the physical-mental processes underlying the moving, we will reach new levels of perception and experience of the present moment. The work includes exercises arising from contemporary dance, Contact-Improvisation and Taj-ji Qi-gong. Starting from the anatomical level of the movement, we will lead to explore the poetic sphere of dance and instant composition. The class is open to all beginners and profesionals dancers. Born in 1977 is an Italian dancer specialized in dance improvisation and in the Art of Instant Composition. His educational background includes years of study of the martial arts, contemporary dance, contact-improvisation and physical theater. Graduate at the University of Rome in Cultural Anthropology in 2004, he is dedicated since then to the practice and teaching of dance and Tai-ji Qi Gong. As a performer he participated in the creation of different dance’s pieces and theatre projects in Italy, Spain, Holland, Belgium, France, Switzerland, Greece, Austria, Germany and Norway. Since 2012 he is part of the company “Allen’s Line” of Julyen Hamilton based in Brussels. For over 10 years he is taught classes and workshops in different festivals and dance schools in Europe as United States. All night you can sleep in Spazio Seme with the sleeping bags. For all intensive workshop in Spazio Seme 50% discount for people who come from abroad!! !